Recently, I went about making some of it into a healing salve, although I also reserved a small amount of the oil to keep separately for certain circumstances where an oil might be more beneficial. After letting an herbal oil infuse for at least 6 weeks, making a salve is really quite simple. Before beginning, however, the plantain must be strained out of the oil through cheesecloth. 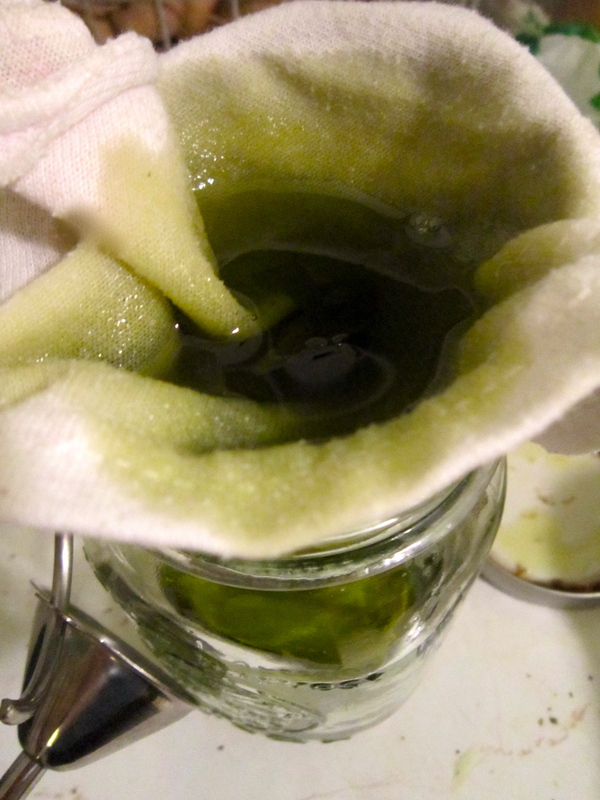 Straining plantain oil through cloth. You’ll be left with plantain-infused oil that has obviously absorbed a lot of the plant’s medicinal properties (look how green it is!). 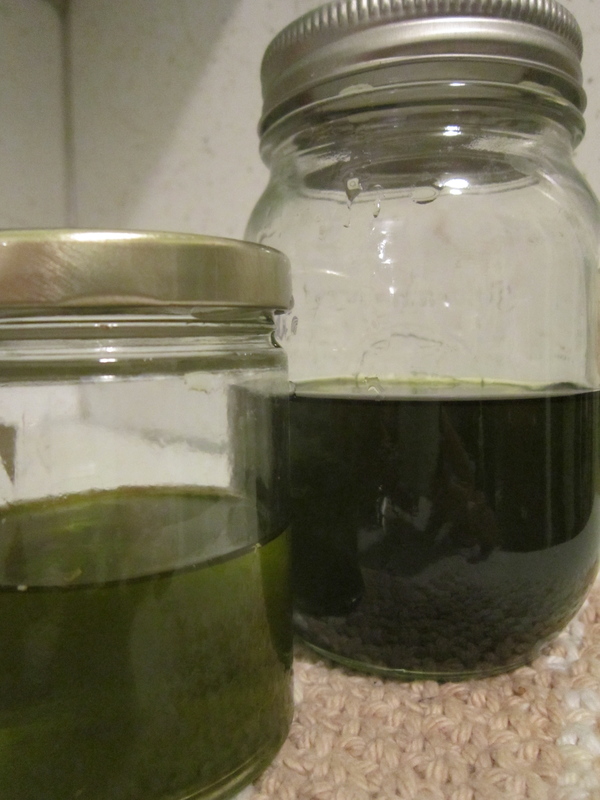 Calendula oil on left; Plantain oil on right. At this point, I recommend letting the oil sit for several hours. If any water is in the oil (from the plantain leaves) it will separate to the bottom of the jar and can be left behind as the oil is poured out to make salves or to be reserved in its own container. This will assist in the longevity of what is made. To actually make the salve, I find it easiest to set up a version of a double boiler by placing a measuring cup into a small pot that contains an inch or two of boiling water. I measure out a tablespoon of beeswax for each ounce of oil that I’ll be adding, and the beeswax goes directly into the measuring cup where it is allowed to melt completely. Melting beeswax in the double boiler. 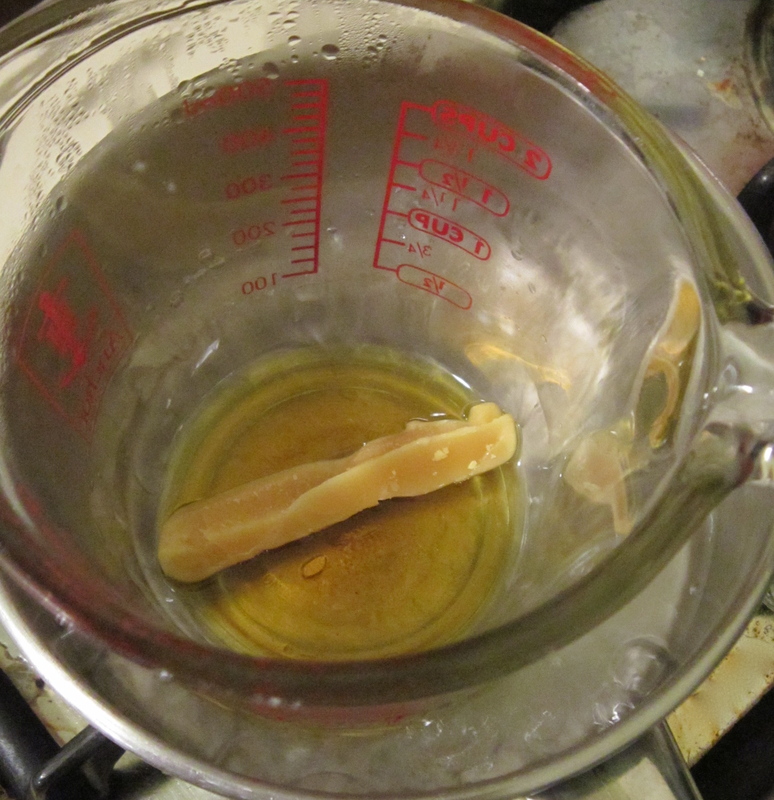 After the beeswax has melted, add the oil (remember the ratio 1 Tbs beeswax to 1 ounce oil). The cold oil will make some of the beeswax bead up initially, but be patient and the mixture will soon turn homogenous. I use a chopstick for stirring to assist with this process. When everything is blended together, test the consistency of the product by placing a drop of the liquid onto the counter. The drop will solidify and allow you to check the texture of your salve. If it is too runny, more beeswax is needed. If it is too firm, add a little more oil. Hopefully it will be just right! The final step is to add the product to small containers. 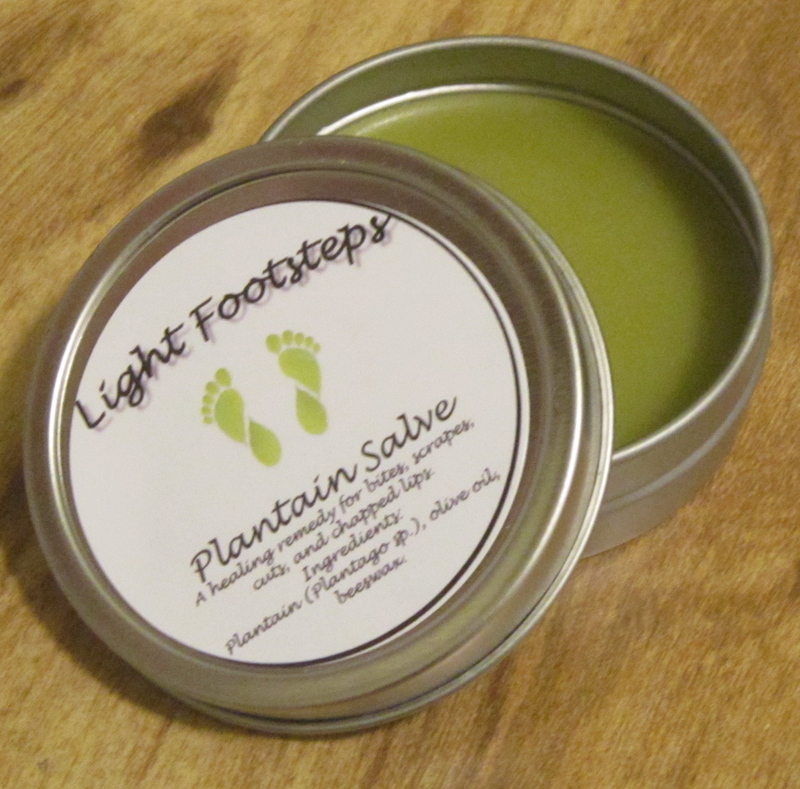 From there, you’ve got an all-natural, healing salve that can be used on cuts, scrapes, bites, and skin irritations of all varieties. It’s also a nice blend to put on chapped hands or lips. Perfect for the coming change of seasons! 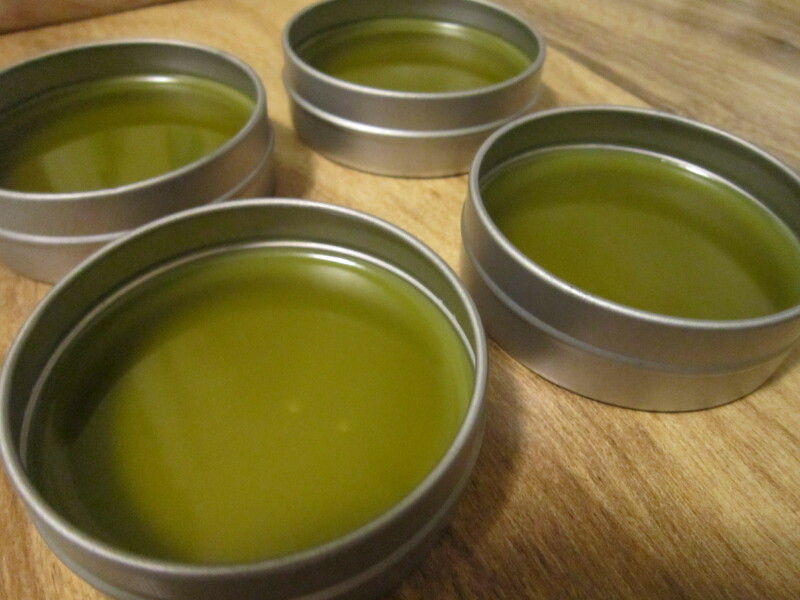 Freshly poured salve. Ready to start solidifying! Beautiful oil! I make healing salves as well, but usually with Calendula. I have yet to be SURE i’m positively IDing plantain, even though i know it grows everywhere. Very nice! 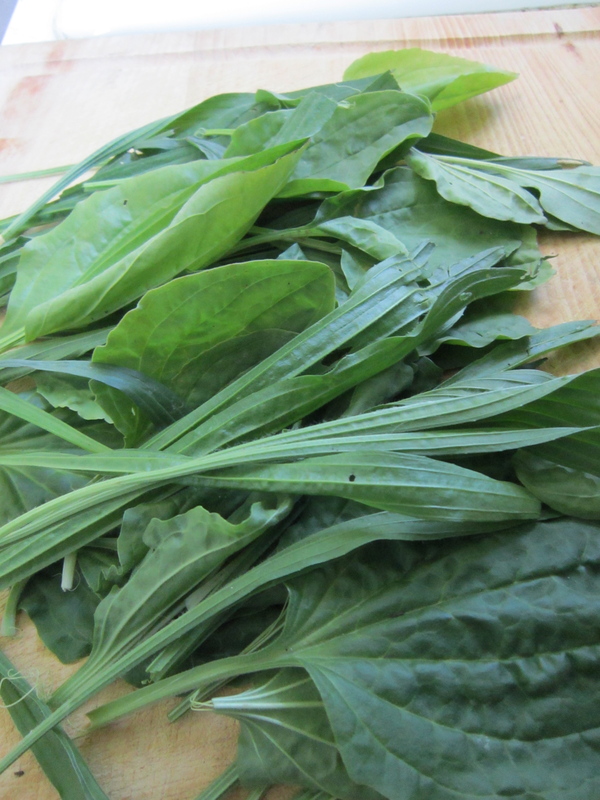 There really are so many beneficial “weeds” right in our own yards. Its great so see other sharing the knowledge that can lead us back to better health and save money in the process! Chrysanthemums, dandelion, agrimony..the possibilities are everywhere! This looks incredible. My own tiny lawn is overrun with weeds, but the more I learn about each one, the more I realize what a huge disservice it is to dismiss them as weeds. Plantain lily in particular. Can’t wait to try this.